We held our first tournament at the Bond Park Community Center and had 14 participants (pictured). Everyone involved had a very enjoyable time and we learned a lot about running a Pickleball tournament. Future plans call for running our first sanctioned event. The group playing at that location continues to expand and we are now working with the Town of Cary on identifying public courts to be painted for outdoor Pickleball play. Two courts at the Weatherstone sub-division have now been painted (I did this myself in order to save cost) and play there has begun. Next month we'll be scheduling another training session in order to get more residents involved. 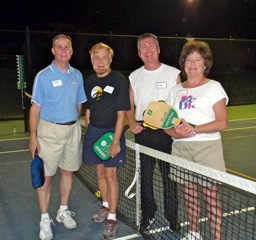 Special Friday night pickleball events continue to be held at the Brier Creek sub-division. The winners of the April round robin event are pictured here: (Vince Tumminello & Mike Walsh, (#1) and Win Farin & Bubba Grant (#2). The May event will be a pot luck/Pickleball event with round robin play. The Raleigh/Wake Senior Games demonstration event is now slated for May 10th. Eight players from the Cary Bond park group will play the demo games with Mike Walsh providing coordination and program promotion. Mike and Lyn Walsh traveled to Pinehurst NC and working with Matt Downing (Tennis Club Pro) and Rudy Van Zanten (supportive resident) initiated Pickleball with a kick off clinic, which resulted in a further commitment for play at the Pinehurst Tennis Club. Since then paddles and balls have been secured and identified trainers are now in the process of launching a Pickleball program.